A Mother's Love: Jessica Chastain plays Mrs. O'Brien, mother of R.L. (Laramie Eppler, left), Jack (Hunter McCracken, right) and Steve (not pictured), and a character who filmmaker Terrence Malick portrays as the very embodiment of grace. Rated PG-13 for some thematic material. There's not a frame of The Tree of Life — not one — that I wouldn't love to have hanging on a wall in my home. And there are relatively few frames of The Tree of Life that I'm sure I entirely understand. The film is gorgeous and abstract, leaping around in time and space, structured in movements and more like a symphony than a conventional narrative. 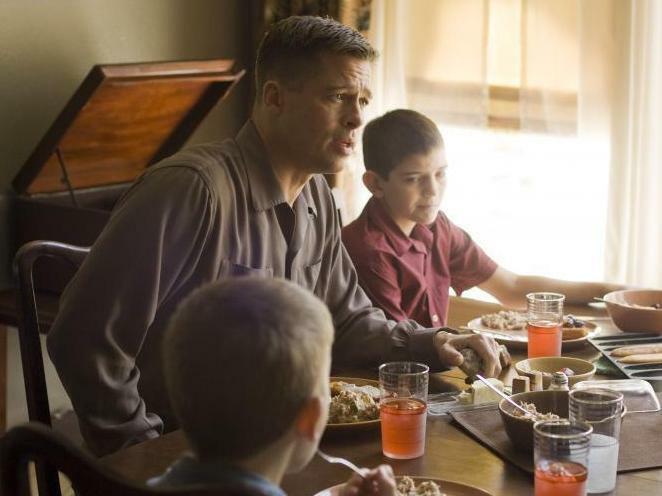 The film centers on a family in Waco, Texas, in the 1950s: a stern, Eisenhower-era patriarch (Brad Pitt); his ethereal, pale wife (Jessica Chastain); and their three rambunctious young sons, who are torn between them as children often are. "There are two ways through life: the way of nature and the way of grace," the mother tells one of her sons, stating the film's theme early on. There's little doubt which path she's chosen. She's so filled with grace, so crazily idealized by the filmmaker, that at one point he has a butterfly alight on her outstretched hand. Pitt's patriarch, with his jutting jaw and buzz-cut hair, is attuned not to grace but to a natural world that can be both nurturing and volcanic. One of their three boys will die at 19, an event so shattering that to make sense of it, director Terrence Malick looks to the very origins of the universe. With help from special effects master Douglas Trumbull and cinematographer Emmanuel Lubezki, the director conjures galaxies and nebulae on screen. Planets form. Lava erupts, then cools. Life begins with cells, plants, invertebrates, then dinosaurs — yes, dinosaurs, including one that exhibits something that almost looks like compassion. I remember reading a James Michener novel once and marveling at its stately narrative pace, so unhurried that on page 87 mountain ranges were still forming. This passage in The Tree of Life is like that. It's as if, to understand the death of a young man, we need to understand everything that led to his creation, starting with creation itself. Father Knows Best: Malick's father figure, played by Brad Pitt, works to harden his sons against life's disappointments by, among other things, teaching his son Jack (Hunter McCracken) to fight. Then we're plunged back into an Eden before the fall, envisioned as a '50s suburbia that's reportedly not unlike the one the filmmaker grew up in: a graceful mom, stern dad and three young boys all still happy as they play kick the can, break windows and run carefree through white clouds of DDT. Jack, the eldest of the boys, is ever wary of his father, who's been disappointed and hardened by life — and wants his sons hardened, too.